The World Restaurant Awards held their inaugural awards ceremony last night in Paris. The overall off-the-grid destination restaurant winner, plus best restaurant of the year winner was South African chef, Kobus van der Merwe for his restaurant Wolfgat in Paternoster. Peruvian tapas? Poke? Or is Chinese bao in this month? Having a truly authentic dining experience has become a bit of a Herculean task. It's so often, so very, like, yeah, totally, pretentious. Popping up faster than plates are cleared at Cape Town restaurants, many hyped-up eateries offer crowd-pleasers instead of meaningful food. But how many of the new up-and-comers keep its standards up year after year, offering customers high quality service and sustainable menus? 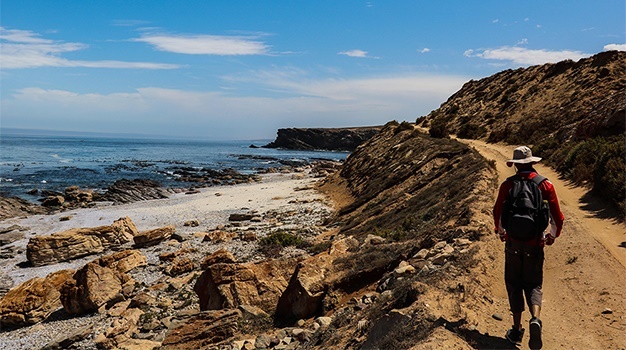 The man at the helm of Wolfgat, Kobus van der Merwe, owns a 20-seater eatery sitting atop a cave on Paternoster beach in the Strandveld on the West Coast. Last year, he won the 2018 Eat Out S.Pellegrino & Acqua Panna Chef of the Year award, and this year was crowned Restaurant of the Year at the World Restaurant Awards for 2019. I have been lucky enough to dine at Wolfgat three times: On the day it opened in 2016, then again in 2017 and then last weekend. The experience has stayed the same each time: absolutely flawless. Going to a place like Wolfgat is about more than seafood. It's about being completely and totally consumed by nature and all of its elements. The lightness of this place, the indigenous ingredients paired in such a rare and imaginative way with fresh sustainable seafood, paired with delightful regional wines. Basically, an amalgamation of nature. And there are no garnishes. Everything is as it should be. Combinations with purpose, not pretence. Think bokkoms flaked in butter, rooibos smoked yellowtail, "soutslaai", "vygie" blood, aged-Amasi, "klipkombers", smoked mussels and grapefruit, and dune celery. You cannot and should not go here if you're finicky, a difficult eater or fussy or if you're just going for the Instagram. Ingredients are foreign, foraged within a 10km radius and are, in the end, all fundamentally flavour-functional in each dish. Authentic to the bone, Wolfgat's identity is solidified in the Strandveld, its sand, its skies, its sea and its seafood.